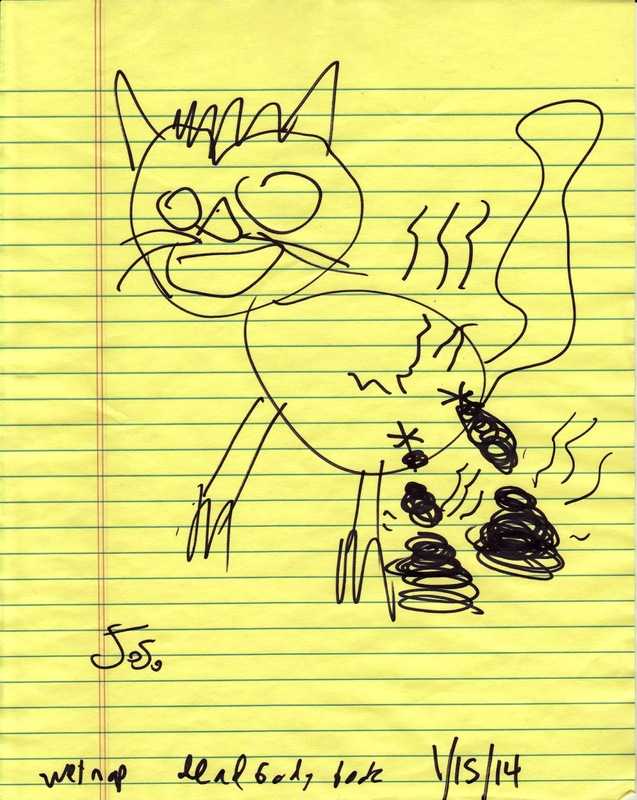 Here is a drawing I made in my joke-writing legal pad. It's called Double Poopin' Kitty. That's mainly because it has two buttholes and it is poopin out of both of those buttholes. You can buy my art for a buck (while supplies last)*. This picture has sat next to some of the finest jokes I have written in my legal pad. Some of the glory of my awesome jokes has rubbed off onto this picture and you can have it in your home for just a buck. Impress your neighbors. Show your family that you are somebody! You have original Jake Sharon art hanging in your house! Holy cheese! I'll even mail it to you in a re-usable manila envelope. Wow. That's two things you get! By the way, I know where the post office is because I am an adult! The post office is that weird place on South Congress that keeps their self-service lobby open 24 hours so Austin hobos go there to pee-sleep.